Texas Freckles: Eighteen down. Sixty-two to go. Eighteen down. Sixty-two to go. It's 2:15 p.m. I'm still in my pajamas. I ate a slice of leftover chocolate creme pie for breakfast because it was fast and required no preparation. I haven't had lunch yet. I'm neglecting the dishes in the kitchen and and the mess in the living room. Why? Because I can't put this down! I started hand quilting the Paintbox quilt late last night and have been working on it all day today. I had to take a break to give my hands and elbow (ouch!) a brief rest. Beep! Break's over. Only 62 blocks to go! I hope I finish before my fingers start to bleed and my elbow requires a brace, because bloody fingers and an arm brace are going to seriously slow me down. Yup! That all sounds about right! Me too! LOL! You go girl! I have some of my fabrics all laid out, but have not started my paintbox quilt yet. But I will. And I'm on the lookout for a "deal" on the perle cotton because you sure got a good one! On ebay there is what seems like a good deal. But the brand is Rubio from Paraguay. Does anyone know anything about that brand? GO, GO, GO....I have often sat at my quilting frame for 8 hours plus until my eyes just couldn't focus. Obsessive behavior, but I love a fast finish. You're off to a great start! I love it. I just got all the supplies I need to start hand quilting my daughter's Fairytale Patchwork quilt. I hope mine comes along as well as yours! What kind of quilting frame are you using? I had to run around town to find one. You can do it. I really don't like to do hand quilting but when I do get started it's very hard to stop. I am rooting you on. This is when I let the kids have cereal for dinner and keep on going! THe hand quilting looks fabulous! Quilt woman, Quilt!!! It's looking fabulous. Ps. Breakfast pie sounds fabulous! Great tip to know; when you bleed on your quilt - use your own spit to remove the little droplets of blood! I know it works...from experience ;->....so quilt away!!! So pretty! I have so many tops to quilt, I have been talking myself out of handquilting, but your picture makes me want to drop everything and pick up needle and thread. Great photo of very pretty blocks and stitching! Looking good. Can't wait to see it! Seriously, nothing wrong with wearing pjs at 2 in the afternoon! I didn't even take a shower until 6pm... hey, its Independence Day, we can do whatever we darn well please! :-) haha GORGEOUS quilt/quilting too! Gorgeous quilt and gorgeous quilting! Keep at it, it's worth it! 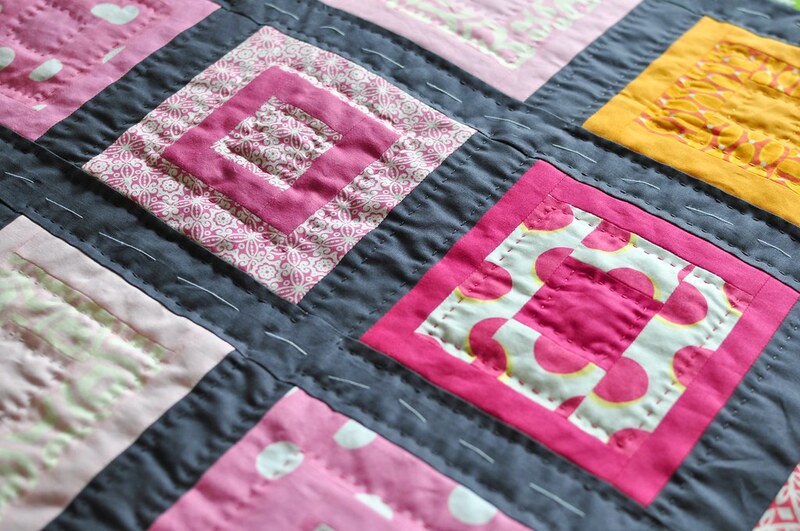 As one of the few quilter's still exclusively hand quilting (for now anyway), I applaud you! The hand quilting looks like something I would really enjoy, and you've already got my brain going overtime on making hexies!! It is going to be a busy summer, in a good way! I love how the excitement of a project can propel your progress! have fun...it looks beautiful! I am trying a little something new on my blog if you would like to drop by. There is no pressure, it was just a little idea I had. What is the colour you are using to sash the squares - it looks amazing against the brights. So pretty so far. Yu sound so much like me - 3:30 a.m. and I was just leaving the sewing room. Is there any cure for the madness! I just got my spoonflower email that said you won!!!! Yeah!!! Congratulations!!! Of course you won, your design was great. Congratulations! I just wanted to tell you I absolutely love this quilt you did! It is just so striking. Completely my style as I love any and all bright colors, and I especially love them paired with a neutral to make them pop like yours does. Nice! Totally relate to not being able to stop. Hand quilting is so addictive and very rewarding when you are done. I just finished a Christmas quilt and have only to bind it now... I'll have to try that paintbox quilt though, it's very beautiful.